Spray 13x9-inch (3-quart) baking dish with cooking spray. In 12-inch nonstick skillet, heat beef over medium-high heat until thoroughly cooked, stirring frequently. Drain. Stir in tomato sauce. Reduce heat to medium; cook 5 minutes, stirring occasionally. Meanwhile, in medium bowl, combine bell pepper and onion stir-fry, and ricotta cheese; mix well. Spoon 1/2 cup of the Alfredo sauce in bottom of baking dish. 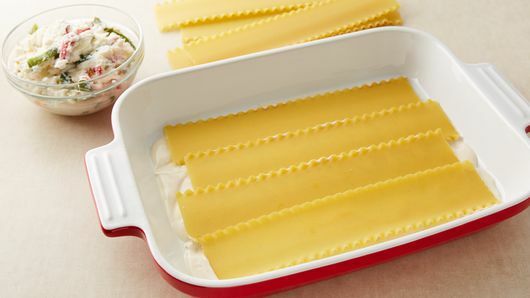 Arrange 4 uncooked lasagna noodles over sauce. Top with half each of the ricotta mixture, spinach, beef mixture and mozzarella cheese. Repeat with remaining noodles, ricotta mixture, spinach and beef mixture. Spoon remaining Alfredo sauce over top; sprinkle with remaining mozzarella cheese. Spray sheet of foil with cooking spray; place sprayed side down on baking dish and seal tightly. Refrigerate at least 4 hours or overnight. Heat oven to 350°F. Bake covered 45 minutes. Uncover; bake an additional 20 to 25 minutes or until bubbly and thoroughly heated. Let stand 5 to 10 minutes before serving. 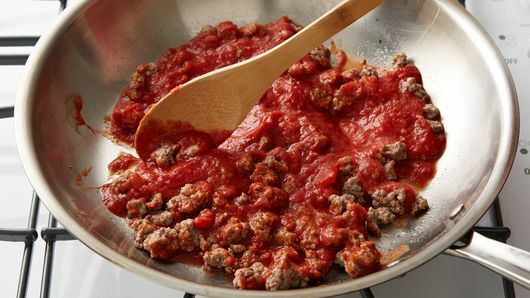 For a nice change of flavor, you could substitute 1/2 pound of Italian sausage or 1/2 pound of the ground beef. Drain the spinach in a colander, then squeeze in paper towels to remove as much moisture as possible. If you have leftovers, you can freeze them in individual serving sizes. Wrap each serving in aluminum foil and freeze for up to 2 months. Lasagna is an excellent candidate for a make-ahead meal since it typically needs to be refrigerated for a few hours before baking. It can be refrigerated overnight too, which allows the flavors to blend even more. If you find yourself with leftovers or you’d like to make lasagna to keep in the freezer, you can store lasagna in the freezer by wrapping portions in plastic wrap. Once the pieces are frozen solid, move them into a large freezer bag. 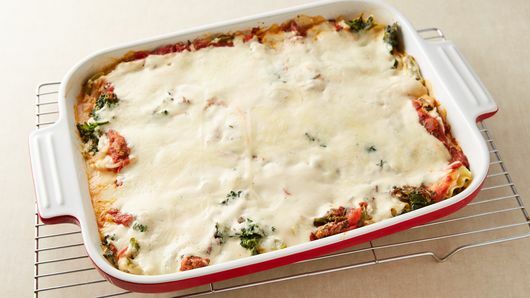 When you’re ready to enjoy your lasagna once again, make sure you thaw it overnight in the fridge prior to reheating. Then preheat your oven to 425°F and place the portions into an oven-safe dish. Cover the dish with foil and bake for 20 to 30 minutes until the lasagna is hot and bubbly. 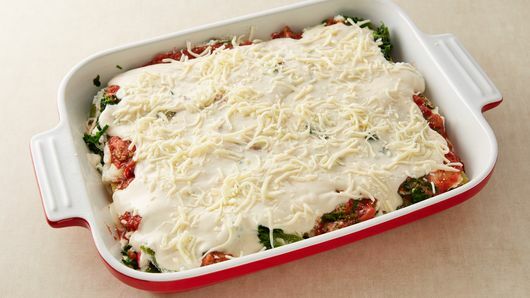 Another option is to make a lasagna and store it in the freezer so you have a comfort food dinner you can bring to a friend, neighbor or new mom, or so you have an easy dinner for a weeknight meal. Be sure to thaw the lasagna in the fridge overnight before you reheat it in the oven. 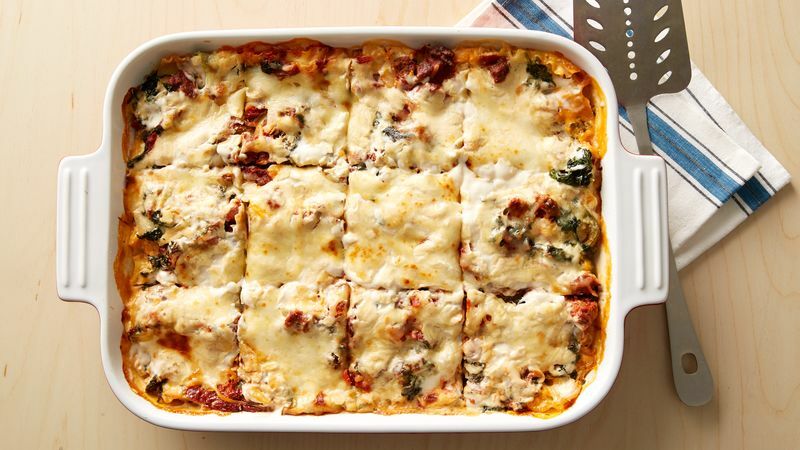 Was this spinach lasagna a breeze to make? Read our how-to-make-lasagna tutorial to discover more essential tips to bring your lasagna from basic to brilliant. Plus, we’ve got some twists on this pasta classic that you won’t see coming!